Kevin’s workplace has a big to-do for St. Patrick’s Day every year, including a tradition that has grown to include employee home brews and food pairings. 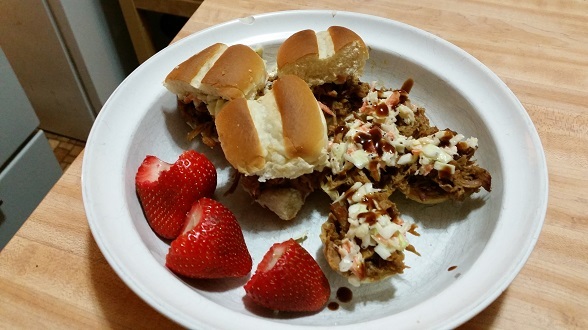 Kevin made these pulled pork bites, and the slaw on top. He even made some little empanada shells, and brought phyllo shells and white bread buns. He brought home the leftovers and we had some for dinner tonight with a few of the first organic strawberries in stores this season. Tonight’s dinner was inspired by Pi Day. 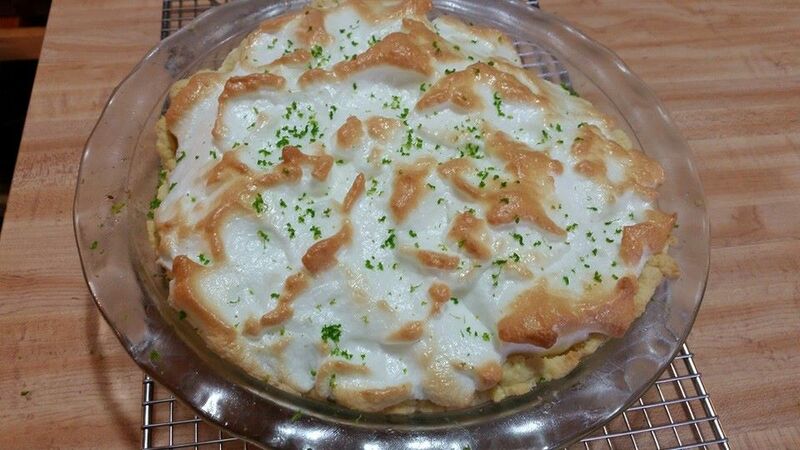 I baked a lime meringue pie. Then I made this dinner. I used a favorite recipe for a fish curry that uses mustard oil. For the carrots and parsnips, I found an intriguing glazed carrots recipe in The Best of Lord Krishna’s Cuisine. I made a totally unauthorized substitution of some beef stock for the sparkling water and juice. And I broke a culinary rule by serving fish with cheese, but I think there should be an exception for macaroni and cheese. The pie… it came out better than the last time I tried to make a citrus meringue pie, and accidentally doubled the liquid so it ran when I cut into it. The first slice of the Pi Day pie came out looking very nice, actually. But overall, not an excellent pie. The crust shrank, and I would have liked the filling to be more tart. The custard held together when I sliced it, but it still wept. I might be looking for a better recipe. This morning, I opened the can of fava beans in the cupboard, chopped enough garlic to ward off the Devil, and approximated the breakfast I fell in love with in the hotel restaurant where we stayed in San Francisco on our vacation. It was an ill timed trip—I was not well, then Kevin was sick, and a lot of things went wrong—but this Moroccan breakfast of cumin-scented, stewed fava beans with an egg poached on top, and a little stack of warm, quartered pita bread, was good, and right. I went back for it the second morning and said, “When I get home….” I bought the beans and there they sat, through another year of egg-and-toast. I wanted to make some authentic hoppin’ John for today, with real red cowpeas and Carolina gold rice, like I read about on Serious Eats, but I couldn’t find the ingredients, and the version I’ve made for years, just isn’t that tasty. 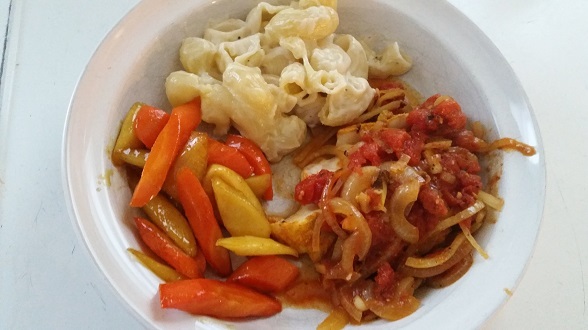 This dish became the substitute when, first meal of the day, I wanted something different that wasn’t all about my bread. I usually get really good bread from a local bakery, but they’re on vacation for the holidays, and I’m reduced to eating my own bread. First time baking in years, and I overproofed and neglected the dough, so the results are a little sour and squishy. 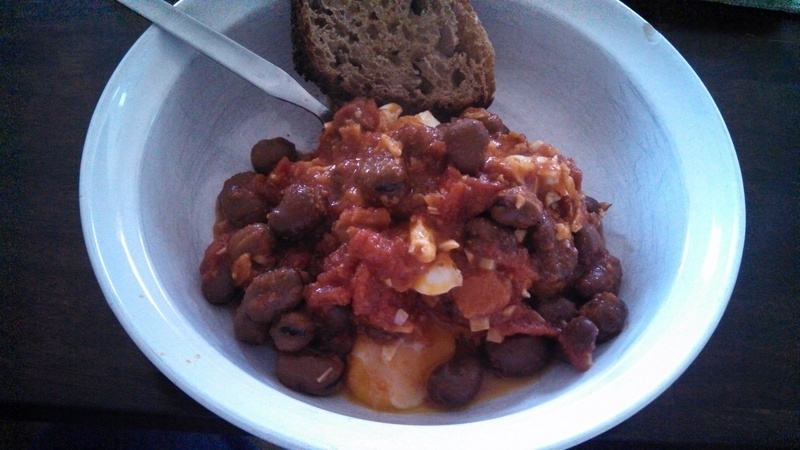 So it’s not what I usually eat, and no better, but it’s inspired by good intentions, it used what I had on hand, and it had everything it needed, everything I needed, on this very cold day. Perfection is the enemy of the good, especially at breakfast.